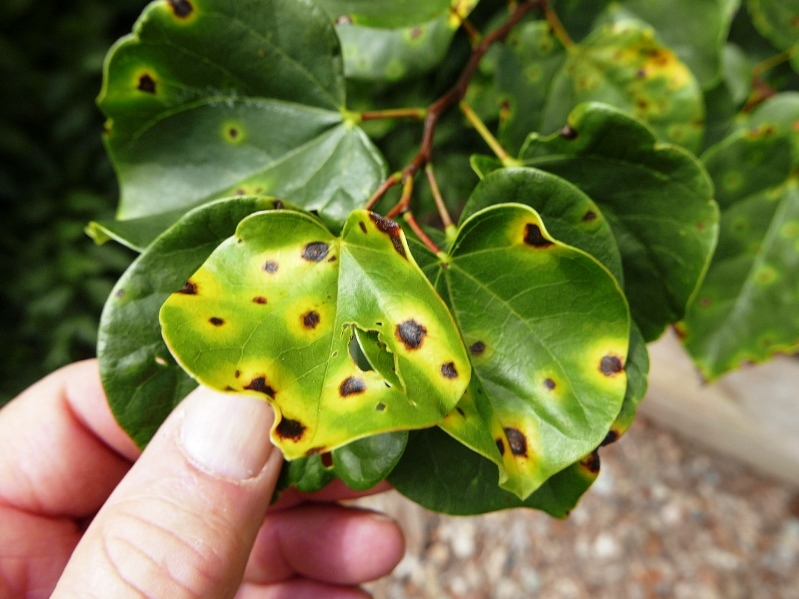 Diagnostics – why good plants go bad – is a big part of what we do at OSU Extension and a key skill for all horticulturists. I was doing a walkabout yesterday at the Secrest Arboretum just outside my office in Wooster, OH and took a few pictures. I realized that some were perfect lead-ins to the 84th Ohio Plant Diagnostic Workshop coming up on Friday, September 8 from 10am to 4pm. For the program agenda and to register, see "More Information" below. There was a pawpaw leaf spot I had not seen before. Is it Mycosphaerellao or Cercospora? We shall see. There was the familiar Guignardia leaf blotch disease on buckeyes and horsechestnuts (Aesculus spp.) seen every year, highly variable on different Aesculus taxa. Note also the lack of this disease on bottlebrush buckeye. However, here is physiological leaf scorch can occur during dry periods on bottlebrush buckeye. Also note how different symptoms of this leaf scorch are from leaf blotch fungal disease. There were examples on my walk for plant identification samples (#1 Question of the 25 Questions of Plant Diagnostics). Clustered terminal buds on oak. There were the seven pedicillate parts of the candelabra of seven-son flower, Heptacodium miconoides. There were weird diseases such as Phomopsis galls on hickory, growing in increasing numbers on a large hickory each year. There were introduced pine sawfly larvae on Pinus cembra I had not noticed before. There were small older leaves on Japanese snowbell, japonica while newer leaves were larger – why do you think that is? And then there were redbuds. Beautiful redbuds. But some beasts on the beauties: redbud leaffolder insects on everything from ‘Don Egolf’ Chinese redbuds to purple-leaved weeping redbuds. There was a leaf spot disease on some redbuds, but not all: ‘Rising Sun’ was clear of both insects and diseases, at least on this walk. More discussion at the workshop. So, we shall talk about host ranges and out diseases and insects and physiological problems, both common and uncommon. We will have loads of samples and outdoor walks and indoor talks, including enough credits for core and ornamental categories ODA pesticide recertification credits, for ISA credits, for ONLA credits, for MGV credits. Spend the day with the Tree Amigos (Boggs, Draper, Chatfield) and all the assembled experts, including yourself. Eat treats from Templeton’s Scottish bakery. Enjoy a gourmet lunch (last year medallions of beef and chicken cordon bleu, this year – who knows. All for $40. To see the Agenda and to register, see "More Information" below.